Following an unprovoked attack, Lady Thea Winterbrock finds herself the only survivor of a massacre that wipes out her entire family. Relentlessly pursued by heavily armed warriors, intent on returning her to slavers, she is forced to flee over the mountains to the nearest stronghold with family friends. Starved and weakened she is relieved to come across a fellow traveller who befriends her and aids her in reaching safety. Since he too is a wolf shifter she instinctively knows he can be trusted to keep his promise of being her protector but she wonders what he’ll expect in return for such selflessness. 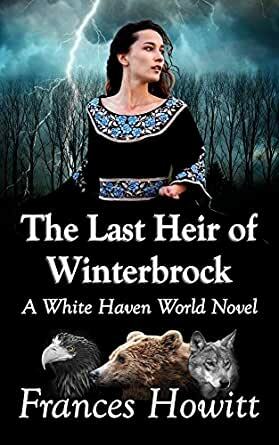 Destitute, her family estate ransacked and probably under enemy occupation, she must use the harsh winter months to gather allies and friends to help her return and reclaim her home and birth-right before it is lost forever. I did enjoy this book and it had an interesting story. It is not a continuation of the Wizards of White haven series and is a story separate from the series in the same world. 2.0 out of 5 starsThis story writen in slow motion! Avery drown out boring story telling! In my opinion the author has a great fantasy, but writes in slow motion and lots of repletion.